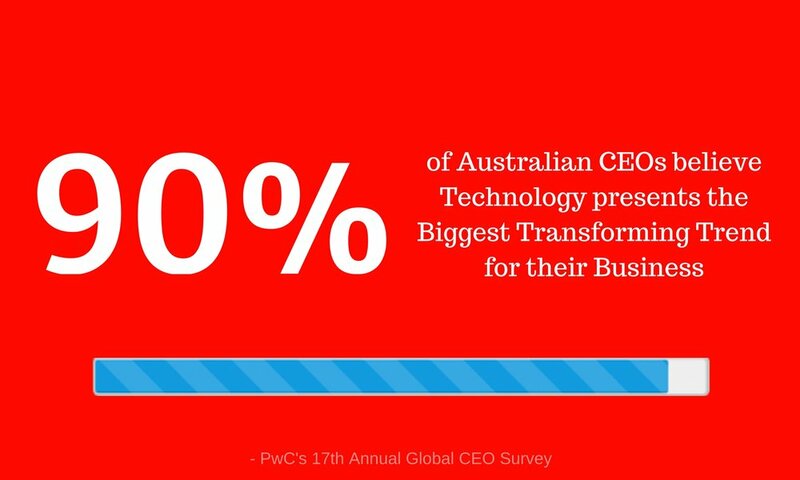 Over 90 percent of Australian CEOs believe technology presents the biggest transforming trend for their business, according to PwC’s 17th Annual Global CEO Survey, however, these beliefs are not translating to a country of innovative pioneers. The same survey showed the CEOs’ commitment to technological advances within their businesses was not reflected in their actions. Australian CEOs are very conservative in this arena; only 45 percent of those surveyed have completed or already started on a technological investment program, and the track record for successful business transformations involving IT is abysmal. Despite changes already seen in IT, such as the growing digital economy, social media, burgeoning mobile apps and cloud computing, and the fall in costs for such technology, businesses are not adapting or increasing innovation - and productivity is declining as a result. This is no time to sit back and watch others and be too scared of making a mistake. Instead, take a leaf out of Thomas Edison’s book: “'I have not failed. I've just found 10,000 ways that won't work,” and develop a strategy for the digital age. Businesses need to find the right IT solution now, or fail fast and get moving with the next idea - innovation is the key to business success in the digital age. Amazon, Google and the UK Government are all leading examples of IT innovation. Instead of upgrading IT equipment using outdated procurement procedures that are better suited to buying defence equipment for a small nation, it makes more sense to invest in complete system integration that delivers the necessary productivity boost and maintains existing competency. Holocentric’s Modelpedia software helps organisations to operationalise strategy, manage business transformations and achieve operational excellence, by providing a business management system that helps capture, understand, change and optimise their business – from strategy, people, processes and procedures to compliance obligations. Holocentric software stores information in a single location and makes it accessible, easily understood and personalised to suit the needs of each user.